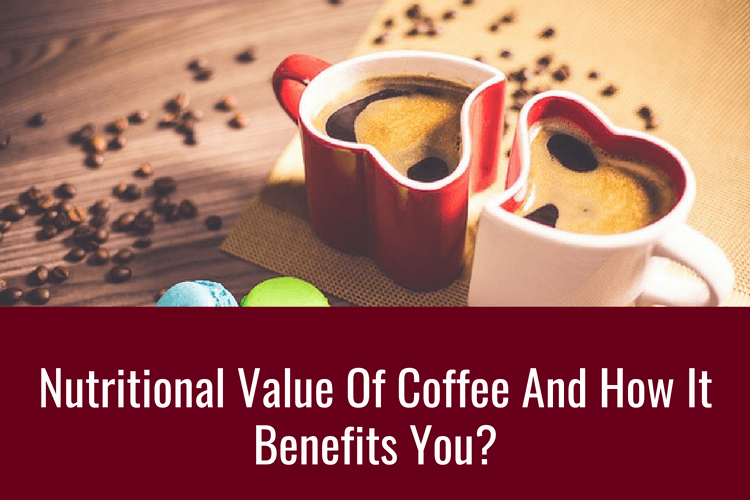 The Nutritional Value Of Coffee And How It Benefits You? There’s a scene in the 1985 movie: Back to the Future, where the main character, Marty, has a frustrating exchange with a waiter by asking for healthy (by 1980s standards) soft drinks that don’t exist yet. Marty finally gives up and says, “Look, just give me something without sugar in it, okay?” The waiter mumbles and puts a cup of black coffee down on the counter. It’s true, black coffee is sugar-free, fat-free, and virtually calorie-free. At least it is before we add those things to it. Coffee is often considered a vice, but maybe we’re being too quick to judge. Granted, wallops of coffee creamer and abundant pumps of sugar syrup are not great for your health, but let’s consider coffee in its blank canvas state, regular black coffee. Can it actually be good for you and does it have any nutritional value? What Nutrients Are Present In Coffee? Riboflavin, or vitamin B2, is an essential vitamin. However, our bodies cannot make it by itself, and since it’s water-soluble, our bodies cannot store it either. Therefore, riboflavin needs to be taken everyday through either diet or supplements. It helps convert fat, protein, and carbohydrates into energy, and breaks down other nutrients. People who aren’t receiving enough daily riboflavin are prone to headaches, feeling sluggish, iron deficiency, and skin inflammation, especially around the mouth and lips. One 8-ounce cup of coffee has about 0.2 mg of riboflavin. This equates to about 11% of the daily recommended dietary allowance (RDA) for adults. That’s a pretty good dose of vitamin B2 in each cup. More vitamin B! Depending on where you look and who you talk to, pantothenic acid is a catch-all, cure-all super vitamin! It helps with everything from baldness to depression to acne to hyperactivity disorder. Wow! BUT! there isn’t a lot of scientific proof to back up these miraculous claims. However, nutritionists will concede that pantothenic acid, or vitamin B5, is important for its metabolic properties and seems to play a role in healthy skin and hair and digestive health. But who knows? If one of these many ailments are bothering you, it might not hurt to take a little extra vitamin B5 to see if it can help. One 8-ounce cup of coffee contains 0.6 mg of pantothenic acid, or about 6% of your daily requirement (RDA). Vitamin B5 is a water-soluble vitamin, so it’s hard, but not impossible, to get too much from diet alone and excesses are mostly flushed away. Potassium is a very important mineral and electrolyte and our bodies need a lot of it to function properly. It’s one of those things that we never seem to get as much as we need, and adults need as much 4,700 mg per day. Luckily, potassium is abundant in many foods and drinks, and that includes our favorite hot morning beverage. As an electrolyte, potassium carries a tiny electrical charge to other cells and nerves that help with balancing fluid levels, and to stimulate muscle contractions, such as a heart beat. Being low on potassium, as you would guess, can be a very bad thing. People low on potassium can have high blood pressure, have a higher risk of heart disease and stroke, joint pain, poor concentration and memory, fatigue, insomnia, and muscle weakness. People who have very low potassium levels can experience serious and perhaps deadly consequences. One 8-ounce cup of coffee contains about 116 mg of potassium or 3% of your daily requirement (RDA). Even though most of use don’t get enough potassium every day, it is possible to have too much, which can have serious consequences as well. A balance is needed for optimal results. Not to be confused with magnesium, manganese is an essential mineral that our bodies are not able to make on its own. So, we have to consume some everyday to keep everything running like it should. Manganese helps our bodies make nutrients such as proteins, carbohydrates, and cholesterol. It helps to keep hormones balanced, aids in bone formation, and has antioxidant properties which help to fight against inflammation and disease. People who are low on manganese may suffer from osteoporosis, anemia, sluggishness, hormone imbalances, and are prone to sickness. Health benefits of manganese are strong bones, high immune system, helps to curb diabetes, balances iron levels, reduces PMS symptoms, and may help with weight loss. One 8-ounce cup of coffee has 0.1 mg of manganese or 3% of your daily requirement (RDA). In most developed, over-nourished nations, it is difficult to have a manganese deficiency. In fact, people are more likely to have too much which can be problematic. Manganese toxicity can lead to liver problems and can cause health defects in the fetuses of pregnant women. Not to be confused with manganese, magnesium is an important mineral that most of us are not getting enough of. Luckily, there are lots of magnesium rich foods and beverages to help boost your daily intake and coffee is one of them! Magnesium is important in the regulation of blood pressure, a steady heartbeat, and helps keeps bones strong. Low levels of magnesium can make a person susceptible to heart disease, high blood pressure, Alzheimer’s, diabetes, and migraines. Likewise, having the proper amount of magnesium can lower blood pressure, improve blood sugar levels, fights disease, prevents migraines, and may even alleviate insomnia and depression symptoms. One 8-ounce cup of coffee has about 7.1 mg of magnesium or 2% of your daily requirement (RDA). More vitamin B! Vitamin B3, or niacin, is a water-soluble vitamin that is most popular for maintaining healthy cardiovascular health. It does this by lowering cholesterol, particularly LDL (bad cholesterol) and triglycerides. Decreasing these kinds of lipids can help prevent heart disease. Other benefits of niacin is that it helps to balance blood sugar levels, therefore helping to fight diabetes. It can also prevent acne, promote brain cognitive abilities, and helps with joint inflammation or arthritis. One 8-ounce cup of coffee has around 0.5 mg of niacin or 2% of your daily requirement (RDA). Like manganese, it is difficult to be niacin deficient in most developed nations. However, it can occur, and those with low niacin levels can suffer from skin lesions and brain impairment. It also can cause a condition called pellagra, which is characterised with hallucinations, skin inflammation, and digestive problems. Not one you want to have. What Diseases Can Caffeine Help? Cirrhosis is a liver disease encompassing a combination of malfunctions or abnormalities of the liver. The liver is a major body organ which produces coagulation proteins as well as removing toxic substances from the body. The liver also regulates sugar and lipid levels in the blood. Cirrhosis, unfortunately, is on the rise in western culture due to diets high in calories, fat, and alcohol. According to a study done by the European Society of Cardiology which included a panel of medical experts, found that liver disease, is reduced by 40% for coffee drinkers versus non-coffee drinkers. Initially, researched thought the high doses of caffeine may be the reason, but the same results were not replicated with other highly caffeinated drinks such as tea. According to Medical News Today, drinking two or more cups of coffee per day, along with an otherwise healthy diet and lifestyle can decrease the risk of death from cirrhosis by as much as 66%. Alzheimer’s is a form of dementia which over the course of several years impedes the patient's memory, ability to think clearly, and eventually interferes with the patient’s ability to perform daily tasks until body functions are completely lost. Unfortunately, there is no cure for Alzheimer’s disease yet, but there have been some encouraging reports on the effects of caffeine on the disease. In 2012, University of South Florida conducted a study that monitored the caffeine intake of a group of 124 people with mild cognitive impairment. After two to four years they concluded that those with twice as much caffeine in their blood did not progress to develop dementia. In the CAIDE study, which began in 1998 in Finland, concluded that drinking three or more cups of coffee a day decreased the risk for later dementia by almost 65%. Heart disease, in a simplistic definition, is a condition generally caused by plaque build-up in blood vessels. Excessive plaque make it difficult for blood to flow and pump through the heart. Results of heart disease can be a heart attack or stroke and are very often fatal. Heart disease is currently the leading cause of death in the United States according to Medical News Today. Somber news, but here’s something to cheer up about: coffee might help. The American Heart Association has traditionally taken the position that caffeine can increase the risk of heart disease. But a new study presented at the American Heart Association’s Scientific Session in 2017 analyzed data from the long term Farmington Health Study and found that coffee consumption may decrease the risk of heart disease by 7% and stroke by 8% with every additional cup of coffee consumed per week compared with non-coffee drinkers. It’s interesting to note that it isn’t just caffeine that seems to be playing a beneficial role here, but caffeine in combination with other health promoting benefits of coffee itself. Coffee has antioxidant and anti-inflammatory properties and components such as kahweol and cafestol that may be possible health inducing benefactors. This doesn’t mean that drinking a daily venti mocha with tons of cream, sugar, calories, and fat is ever going to be considered a healthy choice, but perhaps coffee in its most basic form may not be the vice we once believed it to be.